Saturday, 15th November 08, was a historic day for India as we succeeded in landing our first Lunar Probe on the surface of the Moon. India is now the fourth country to have joined the elite club of space-faring nations like the United States, Russia and Japan. It is indeed a proud moment for our country and a great achievement. “The TV set-sized probe, painted in the green-white-and-orange colors of the Indian flag, made a "precise-to-the-second" landing on the lunar surface late Friday after being released from the unmanned moon-orbiting Chandrayaan-1 satellite”, the Indian Space Research Organization (ISRO) said. All Indians rejoiced and hailed this milestone in India’s space history including the politicians, who for once buried their differences and united to call this event worthy of being recorded in Golden letters. Abdul Kalam, the former President, who conceived the moon impact probe (MIP) is ecstatic with the successful moon landing and hopes that this would fuel a dream in Children for the future and in 15 years he wanted to see an Indian on the Moon. Well, I am sure that day is not very far off. You can read all about the lunar mission and Chandrayaan –1 on the official website of ISRO which has all the details about the spacecraft. 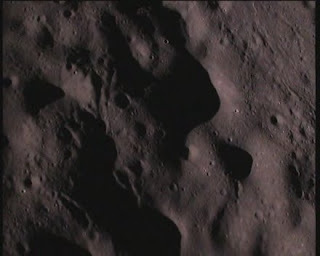 Well, the results of the Moon Impact Probe landing on the surface of the Moon have begun to filter in with the first clear pictures of the Moon surface. 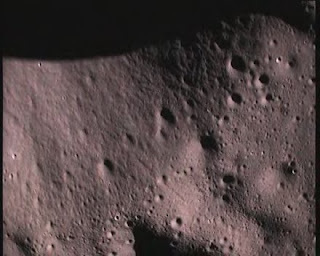 Apparently, The images sent by the MIP will help ISRO determine landing sites for future missions, including that of Chandrayaan-2’s rover.